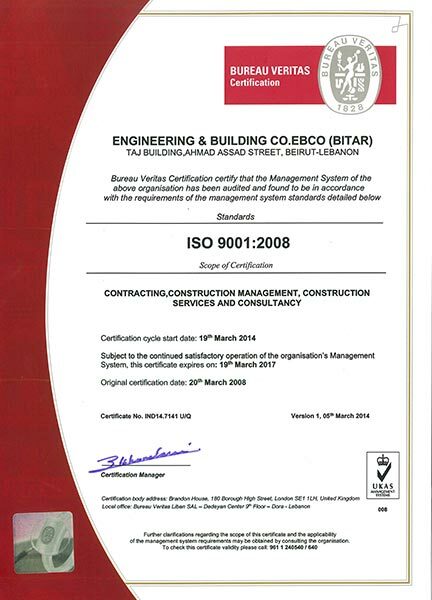 EBCO(BITAR) is a leading provider of contracting services, construction management and engineering consultancy. The management is committed to operate every aspect of the business within standards that offer the highest possible quality of service. With professionalism and transparency, we aim to satisfy our clients and build long-term relationships based on loyalty and trust. We thoroughly search to team up with competent employees and qualified experts to meet the Quality Management System requirements stated in Standard ISO 9001-2008. We are dedicated to continuously train our teams and appraise their performance to work out potential opportunities and reinforce technical proficiency. As a result, by achieving our strategic objective at EBCO(BITAR) through continuously improving the quality of our services and exceeding our clients’ expectations, we seek to sustain our leading position in the market. Copyright © 2019. Engineering & Building Co. EBCO ( BITAR ).